You might have heard about tension fabric displays lately. If you haven’t, you are probably new to the trade show scene or just may be outdated on what the current trends are. There’s no problem with that. Here, at monsterdisplays.com we are a team of trade show specialists willing to help you choose your perfect display and what your best options are. Let’s start saying that there are 3 main types of tension fabric displays. Below is the breakdown and differences between them all. But first, what is a Tension Fabric Display? The uniqueness of a tension fabric display is evident whenever you find one on the trade show floor. With wrinkle resistant and washable fabrics, tension fabric exhibits feature the highest-quality dye sublimation printing. At monsterdisplays.com we carry both outdoor and indoor fabric tradeshow booth options allowing you to showcase your brand in a spectacular exhibit no matter the location! 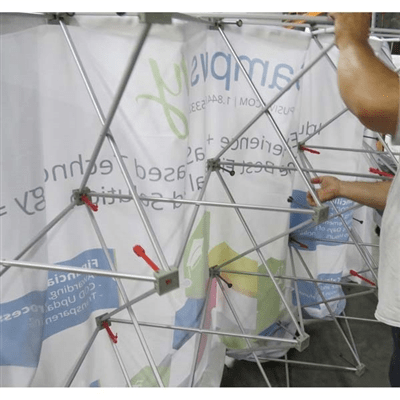 Why buy a Tension Fabric display? The answer is simple. You want to deliver a long lasting eye-catching message to your audience on the trade show floor. Tension Fabric can be printed up to 10ft with no seams, showing vibrant colors and exceptionally crisp images that call visitor attention at a glance. Tension Fabric Displays are lighter weight and easier to set up then most other modular or pop up style display options. In addition to that, the sleek aluminum frames pack super compactly, and you get the most popular portable display of the decade. What are the three types of Tension Fabric Displays? Pop up displays are the most popular design in the the trade show industry. The Tension Fabric variant of it is as functional, portable, and affordable, but includes the benefits of fabrics we explained at the beggining. 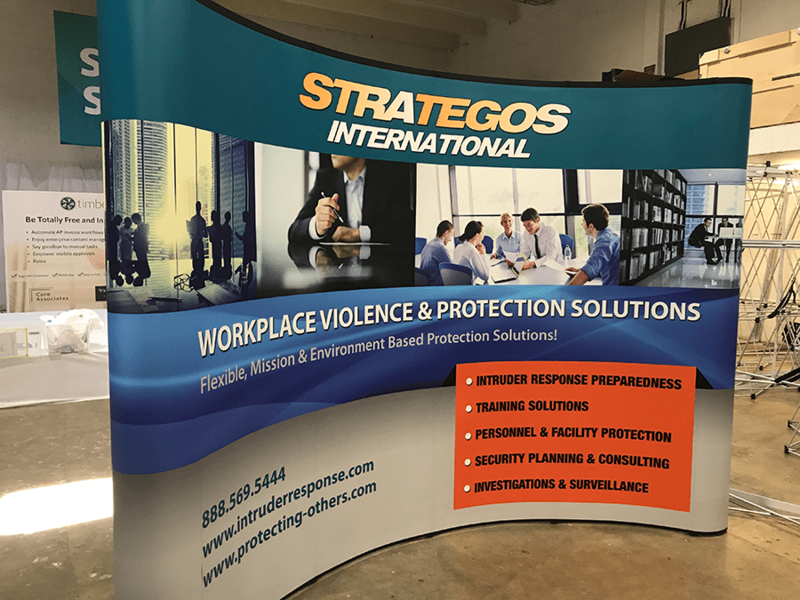 We feature the strongest and most versatile tension fabric pop up trade show displays on the market with custom options and accessories. 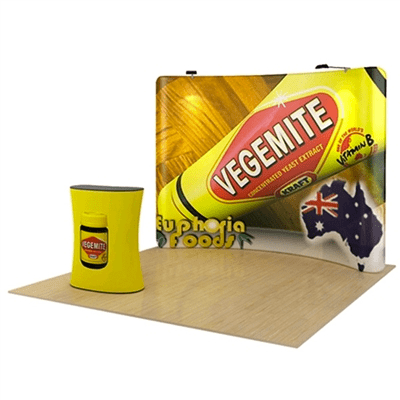 Pop Up Tension Fabric displays Feature a “Pop Up” style frame and the graphics are attached via Velcro. This ideal backdrop features competitive pricing with professional impact, benefiting from a compact quick fold out accordion design. Make your attendees feel like celebrities with an exhibition booth built ready to promote your brand. The tension fabric Pop Up system combines the popular convenience of a banner stand with the impact of a pop up display wall. These trade show booths are portable and effortless to setup with the entire display collapsing into a durable carry bag with casters. Waveline Tube tension fabric displays feature proven quality and attractive designs, while being very lightweight and easy to assemble, with no tools needed. The frame is composed of aluminum tubing that easily connects with snap locks. Graphics are printed via dye sublimation on stretch fabric, that is conveniently installed over the frame in a pillow-case style. A tight zipper secures the fabric in place for a wrinkle-free finish. Most configurations are available with single or double-sided graphics. 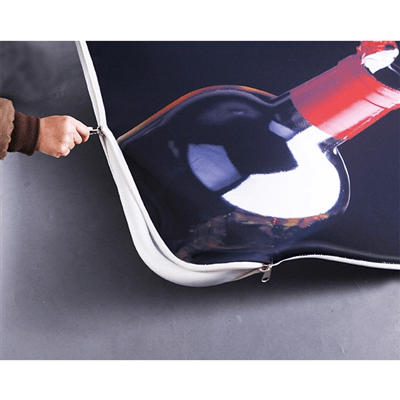 SEG, or silicone edge graphic, is defined as a dye-sublimated printed fabric finished with a thin silicone strip or similar material (also known as a gasket) on its perimeter. The gasket strip is stitched directly to the edge of the fabric on all four sides, creating a cover that is then inserted into any type of frame that has a receptive recessed groove or channel. The size (perimeter) of the SEG graphic must be exactly the same of the frame, so the fabric is taut and wrinkle-free when installed. The result is a portable, compact soft signage solution that mimics the appearance of rigid panels commonly found in displays and walls. So… what is the best option for you? We know it may be challenging to decide what’s best when you have not used a Tension Fabric Display before. Let our trade show experts guide you for free! Chat with us or call 888-434-3344 for free advice. I like your blog. this very informative. It gives information on tension fabric display.